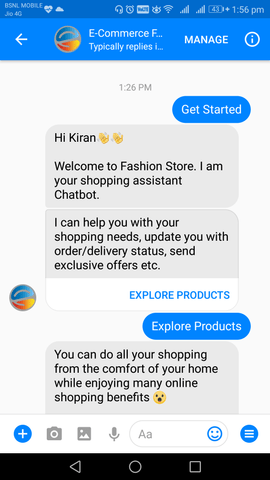 In this post, we have explained everything about the E-commerce Facebook Messenger Chatbot. You can use this as a standard guide while building your own e-commerce chatbot for the store. The global chatbot market is expected to reach $1.23 billion by 2025 with a compounding annual growth rate of 24.3%, according to a Grand View Research report. According to Statista, Facebook Messenger has 1.3 billion active users in 2018. The opportunity for brands to reach a billion consumers is endless. E-commerce is a competitive space. You have to keep listening to new technology trends which will help to reach more customers. Facebook Messenger chatbot provide enormous potential to drive sales to your e-commerce store. Right now, the number of online stores that implement the Facebook Messenger chatbot is increasing each week. Conversational Commerce is one of the hot topics when it comes to Facebook Messenger chatbot. Conversational Commerce refers to the intersection of messaging apps (Facebook Messenger, WhatsApp, Talk, and WeChat) and shopping. 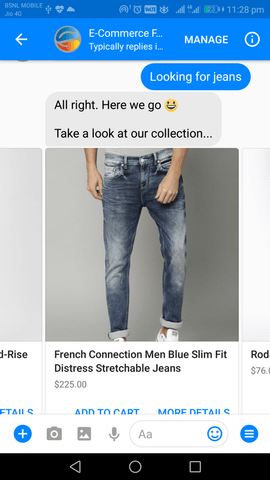 Conversational Commerce allows customers to browse the products, get customer support, complete the payment, get personalized recommendations, and get the order notifications all from chatbots itself. Customer experience is very important when comes to the chatbot. The chatbot should be designed in a way that allows the customers to browse the products, buy the products, and make payment from the Messaging apps very easily. The entire purchase cycle is happening on the chatbot. 80% of businesses said that they already use chatbots or plan to use them by 2020, in a recent Oracle survey. The customer can just open the chatbot and start typing what they are looking for. The chatbot responds very quickly with matched results and a link to the product page. The chatbot can send highly personalized product recommendations based on their search history. From a single query, your unique needs have been translated into a purchase. Online merchants’ biggest headache is cart abandonment. 90% of shoppers leave the stores without making the purchase. Many online stores use email marketing automation to recover these abandonment carts and increase their sales percentage. The good news is that the Facebook Messenger chatbot can help you recover the abandonment carts. If the customer doesn't purchase within 60 minutes, you can automate the abandoned cart campaigns over the Facebook Messenger. The Message can include the customer's cart with checkout button. This approach is 5x more effective than email due to higher opt-in rates. 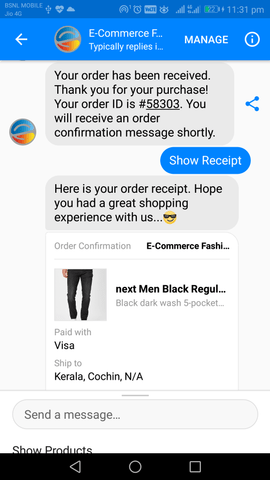 The store can send receipts, shipping/order notifications, and more to the users over Facebook Messenger. This improves the customer experience, and they don't have to open and search their email inbox every time to see if there are any updates regarding their orders. When it comes to a chatbot, the consumers expect the chatbot to understand natural language. You should take this feature very seriously if you want to create a smart chatbot. Most of the e-commerce chatbots out there lack these features and are built upon the flow-based model with a series of buttons. Customer support is another area where chatbots can be utilized effectively. Chatbots provide the added advantage of handling unlimited one on one conversation 24/7 and answer basic FAQ like 'what is your return policy? ', 'Will you accept the debit card payment? ', etc. Chatbots can automate the content from your FAQ page, and it's a very good customer experience. The welcome message is always shown to all new users after they tap 'Get Started' or send their very first message. The welcome message is the single most important message a user should see first in your chatbot. A welcome Message is a place where you can include all the available things that your chatbot can do, so that users don't waste their time trying to do things that your chatbot doesn't support. Customers support is another area where chatbots can be utilized effectively. Every e-commerce store needs some kind of customers support. You can’t replace human agents completely. But the chatbot can help the customer to create tickets, make complaints. Chatbots eliminates the waiting queues, and everybody gets equal preferences and the same level of support. Feedback is valuable information that will be used to make your e-commerce store better. In the old days, we used to send emails or SMS asking for customer feedback, and the response rate was very poor. 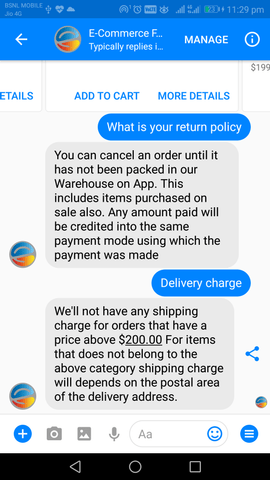 You can send a message to the customer after 2-3 hours after their order has been delivered over the Facebook Messenger. This approach is more effective than email due to higher opt-in rates and has a better chance of getting feedback from the customer. By combining the power of "Machine Learning" and conversations history, a smart chatbot can recommend various products that may suit the customer's interest. When we know each customer and their shopping behaviour, this information enables us to send personalized messages. You can send them offers, news about new products’ launch, etc. This increases customer retention rates compared to the traditional email marketing campaigns. You can use some already available recommendation engine to implement the features like "You might like these products," which show some products of customer's interest. Designing a conversational interface is different from designing mobile apps or web apps UI. Just like you design the website or mobile app before you start the actual development, you can follow the same approach here in the case of chatbot development, too. Here are some conversational design tools that you can use to prototype your next e-commerce chatbot. 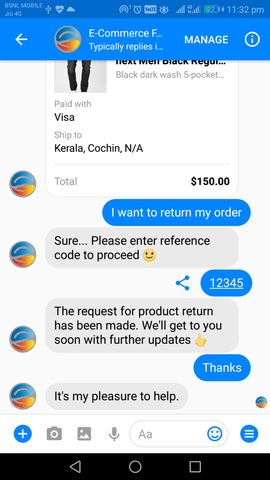 Creating a good e-commerce chatbot is not easy. It takes hard work, multiple revisions, a good conversation flow, a scalable backend, and a robust NLP service. Here are the some of the important feature you should include in your e-commerce chatbot. In a chatbot, the Conversation flow is very important, you need to keep this in mind while building your chatbot. Make sure the user doesn't get stuck in a dead end and always include the fallback intent. Ensure that your chatbot doesn't sound robotic. There are many frameworks or platforms available to build chatbots. Whatever tools you use will directly affect the cost and effort needed for chatbot development. Here are some chatbot development frameworks you can use to build chatbot. Azure Bot Service provides tools to build, test, deploy, and manage intelligent bots all in one place. Microsoft Bot Framework is a part of that. Botkit doesn't support the NLU by default hence you have to use NLU service such as Dialogflow or IBM Watson to parse the user requests when building chatbots with Botkit SDK via Natural Language Processing middlewares. Botkit provides another tool called Botkit Studio which is a dashboard and IDE designed to super-charge Botkit. It includes a web-based interface for building and managing dialog, an activity console, third-party integrations, and advanced analytics tools, like customer segmenting, conversion funnels, and user retention metrics. Dialogflow is a widely used tool for building chatbots. DialogFlow works by creating agents. An Agents are best described as NLU (Natural Language Understanding) module which parses the request. They transform natural user requests into actionable data. DialogFlow support SDK in Node.js, Python, Java, Go, Ruby, C#, and PHP. Dialogflow supports connecting multiple channels from their dashboard. You can also use the DialogFlow with other chatbot building frameworks such as Microsoft bot framework, Botkit. It is always good to know how many users interacted with your chatbot, what are the conversion rates, monitors the user's journey. There needs to be some way to analyze the performances of the chatbot. This is somewhat similar to analyzing website a using Google Analytics. Here are some analytic platforms you can consider for your e-commerce chatbot. Recommendations engines help give customers the shopping experience in which the most relevant products are displayed for them. You can consider the open source projects PredictionIO or easyrec. These are the famous open source recommendation engines available. Implementing these recommendation engines is not that easy, you have to hire an experienced developer with Machine Learning skill. If you are looking for a more scalable and robust products recommendation engine, you can consider the services from AWS or Google Cloud. These are cloud-based services which handle all the heavy lifting, including installation, training, maintenance etc., hence you can focus on implementing the APIs in your e-commerce chatbot or store. Helping businesses to implement Chatbots and Voicebots (Amazon Alexa, Google Assistant).